The cost of textbooks always causes lively debate at the University of New Mexico. Pilot alternative purchasing options that provide materials to all enrolled students on or before the first day of class with automated billing to student bursar accounts. Engage students in multiple ways to improve their course material selection and purchasing habits. Reengineering faculty habits and student behavior may be the most interesting part of the challenge. The solution is a complex equation where the variables keep changing. 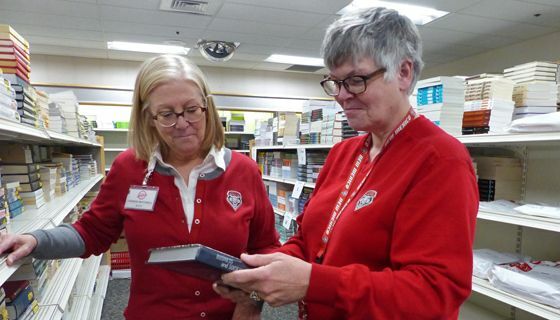 In the middle of every semester, UNM bookstore administrators ask faculty members what books they will be using for courses the following semester. For spring 2016, they began asking for the information in October. UNM Bookstore Director Carrie Mitchell says faculty have a hard time understanding why the bookstore needs to know in October about textbooks that won’t be used for another three months. It’s a numbers problem. Each semester there are around 4,700 book titles for classes taught at UNM. 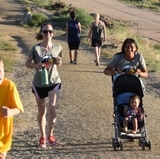 Faculty members must choose the book or books they will use, and send the information to the UNM Bookstore. That begins a frantic process. If the same book will be used for a course next semester, the bookstore will buy it back for up to half price from students. If the faculty member hasn’t told the bookstore it won’t be used again, the bookstore won’t buy it back. At the same time bookstore staff begins looking for alternative versions of the book. Is it available as an ebook? Will the publisher allow the book to be rented electronically for a semester? Some shelves in the bookstore show five different prices for various versions of the book. It takes time to do the research for 4,700 book titles, and if a faculty members turn in his book orders in January, just before the beginning of the semester, the bookstore contacts the publisher and orders the hardback version or electronic version, without the time to explore alternatives or negotiate a cheaper deal. As a result, students usually pay a higher price. Mitchell says on average UNM students spend about $400 a semester for textbooks. Do students really need to buy the hardback version of a book for every class? “If you don’t need to keep a book, life for Psych 105, it might be cheaper to rent it electronically. It’s a big old honking expensive book. If we could do it all digital and get a big price break for the class as they rent it for a semester, that would be great,” said Mitchell. 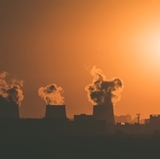 “What we have here is a misalignment of benefits and costs and decisions. As it exists now faculty members and to some extent department chairs make the selection decisions. They gain or lose nothing with respect to the cost of that decision,” said Burd. “That cost is borne entirely by the students. Students can be champion procrastinators. Sometimes with good reason, sometimes not. If buying a $120 textbook just isn’t in their budget, they may try to get by without the book, just going to class and participating. But that can lead to a difficult epiphany. “If I hand out an assignment tomorrow that causes three students in my class who don’t have the book to suddenly realize ‘Oh my God. I better get that book.’ Now they are on Amazon or they are walking over to the bookstore and they are grabbing things at the last minute. They are grabbing them at full cost. They are paying to have them shipped overnight, assuming they are even available. 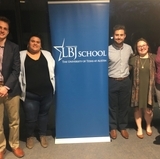 Volume discounts, buybacks, used books, those types of things tend to be off the table or much less available options than they are two weeks before the semester starts," said Burd. Can the UNM bookstore solve the equation? So how do you convince students to buy the book at the beginning of the semester? UNM is experimenting with various solutions. Take Spanish 101. Last summer, the coordinator for the program went to the bookstore and asked for only digital versions of the textbook. Mitchell went to the publisher, negotiated a price for digital only books, took some off the bookstore’s own profit and the students got access codes to online books for a lower price. For fall, it was a little more complicated. 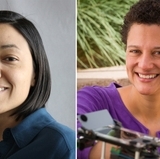 Two faculty members, two different books, 1,100 students dropping and adding the course. Everyone needed instant access to the codes for the books at the same time and Mitchell said the bookstore staff had to scramble to make it all work. For the bookstore it is a constant juggling act. Textbook publishers now raise their rates twice a year on books, and Mitchell says sometimes they make minor revisions in the material within the book and call it a new edition, forcing faculty members to stop and figure out whether there really is anything new that student need to know. There is also the new option of open access. Websites like openstax offer a generic version of textbooks for some basic subjects. “I think at some point we all have to say, really? Has art history changed that much? Sometimes you just have to reexamine,” said Mitchell. Few faculty members are using the free textbook option at the moment, but Mitchell and Burd think it needs to be part of the conversation. In fact, Burd thinks there is a good business opportunity for someone to find a way to help faculty members compare the different books and different options to help them make better decisions on textbooks – something like an online shopping site that includes both traditional and free textbooks, covers all available purchase options, and provides complete information on pricing, availability and quality. Right now the UNM bookstore is on the front line. Mitchell is conducting a survey to determine whether students who “rented” an ebook feel like they got their money’s worth from the experience. 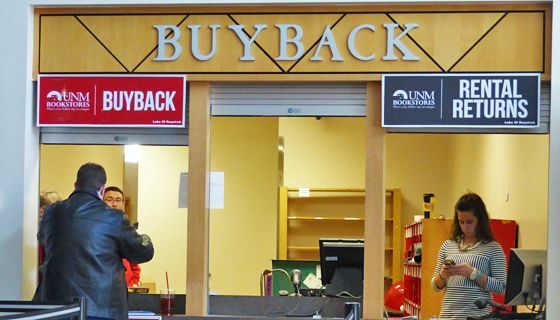 The UNM bookstore is an enterprise activity, which means it does not receive state support. The bookstore must make enough in sales to cover the cost of running the enterprise. It’s also a critical part of the solution. So where does UNM go from here? 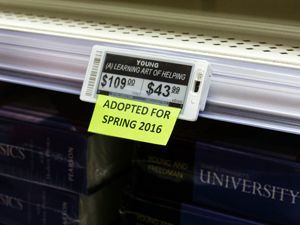 It appears that the bookstore will continue to take the lead on the issue of trying to control textbook costs. Longer range solutions, such as finding a software solution to help faculty members compare costs seem to be taking a back seat to other problems university administrators must confront.. The basic problem on controlling the cost of textbooks isn’t about to go away, but current UNM students are getting a small reprieve. Mitchell said the average price of course materials at UNM for fall 2015 was down seven percent from fall 2014 and down 11 percent from fall 2012.